Could you find time every Thursday between 10am and 4pm to spend a specific hour before the Blessed Sacrament, thereby becoming a ‘Committed Adorer’? This worship has been taking place in St Mary’s for some 14 or so years now. It is an opportunity to enjoy a serene and stress-free hour with Our Blessed Lord, yielding many blessings. There are 6 separate hours that need to be filled. 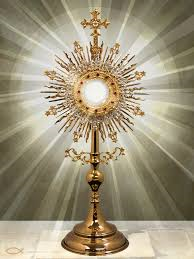 Currently there are approximately 20 Committed Adorers taking part – but we need many more as it is important that the Blessed Sacrament is never left unattended at any time. If you think you could ‘watch one hour with Him’ every Thursday and would like more information, please contact Diane Morgan via the Parish office.